What are the chances you’ll rethink part of your sales strategy today? Hint: probably pretty good now that you’ve clicked on this article! This list of useful and shocking sales stats offers insight into how buyers make decisions, the importance of persistence, and why most of your cold calls don’t lead anywhere. What Drives the Decision-Making Process? 1. 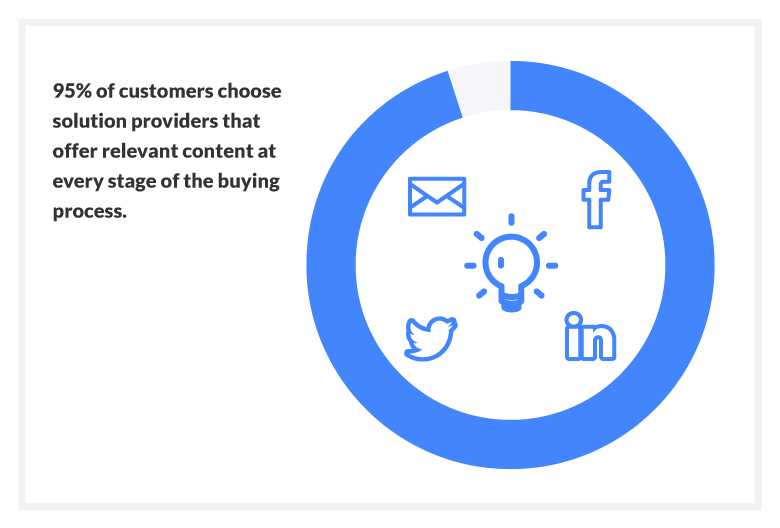 95% of customers choose solution providers that offer relevant content at every stage of the buying process. So, what does this mean for your sales team? Since content matters to 95% of your prospects, your sales reps should coordinate with the marketing team to ensure everyone’s efforts support the same goal: closing more deals. However, this doesn’t mean your content should only target bottom-of-the-funnel shoppers. Research shows that customers prefer to buy from businesses that provide “ample content” to nudge them along at every point in the decision-making process – from lead nurturing emails to compelling case studies that persuade them to make a purchase. 2. 82% of customers viewed five or more pieces of content from the winning vendor before making a purchase. Not only does this statistic underscore the importance of content marketing, but it reminds us that consumers are constantly seeking out information before committing to a product or brand. Online research has become a vital step in the buyer’s journey. Your customers expect to be able to access the information they want anytime, anywhere. If your business doesn’t already produce relevant, helpful, mobile-friendly content, it’s time to start. Create content that shares the information your future customers need to understand what you’re offering and why they should be interested. 3. 70% of purchasing decisions are made to solve a specific problem. Only 30% of buyers are looking for added value or expecting to gain something when they make a purchase. It’s important to frame your product or service in terms of how it solves your prospect’s problem. Make it easy for your prospects to understand how you will simplify a complex task, reduce their expenses, or remove an obstacle. 4. 73% of sales reps who integrate social selling into their process outperform competitors and exceed their quota 23% more often. We all know that social media is crucial to marketing and brand awareness, but it isn’t always so obvious that social media plays a direct role in sales. An Aberdeen report called Social Selling: Leveraging the Power of User-Generated Content to Optimize Sales Results found that salespeople who use social media generate more leads than their counterparts. 5. 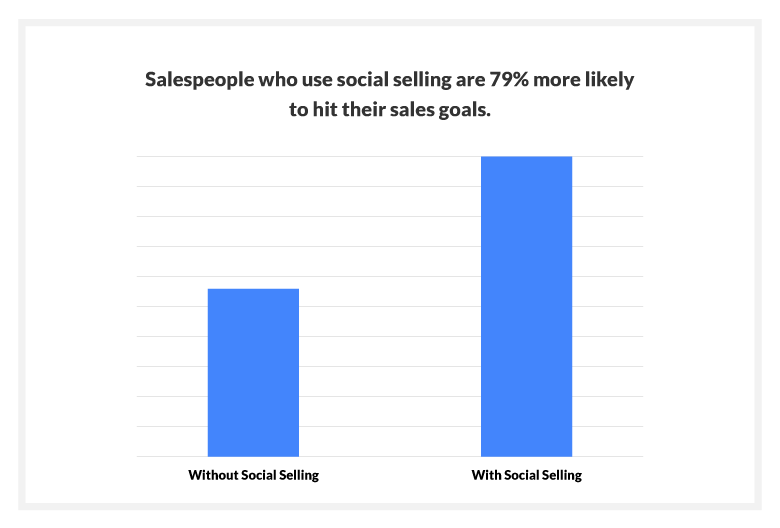 Sales reps who use social selling are 79% more likely to hit their sales goals than those who don’t. Another sales stat from Aberdeen, the research group looked at 182 end-user sales organizations to find out how top performers used social selling to improve their sales. To communicate with customers and prospects via channels they already use. To address the diminishing effect of traditional marketing for surfacing qualified leads. This tells us that top-performers value social selling. Aberdeen also found that 79% of top-performing sales reps hit their quota, compared with only 43% of middle-of-the pack sales reps and only 15% of the weakest performers. 6. 96% of sales reps use LinkedIn at least once a week for an average of 6 hours per week. Social media has evolved into a powerful tool for both salespeople and marketers. Failure to engage with prospects on social channels cuts you off from a lucrative avenue to connect with future customers. As more sales reps come to this realization, they’re investing time into social platforms. For B2B sales, LinkedIn is particularly appealing and can help you identify, research, and connect with prospects. 7. Nurtured leads typically result in 20% more sales opportunities than non-nurtured leads. This report looked at 239 B2B companies in different industries, including technology, enterprise IT, professional services, business services, financial services, and manufacturing. Survey participants were asked about the worth of their nurture programs as determined by whether their efforts produced mature qualified leads, whether those leads were developing into opportunities, and how much revenue could be attributed to lead nurturing. 8. 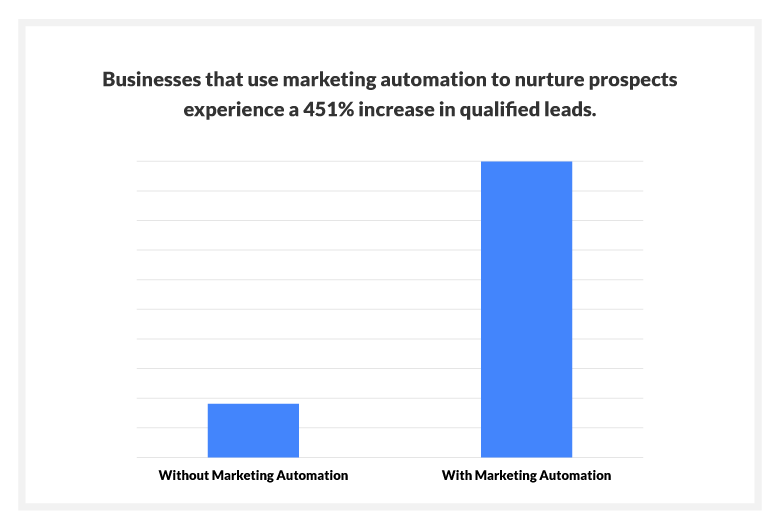 Businesses that use marketing automation to nurture prospects experience a 451% increase in qualified leads. Companies that introduce marketing automation to their nurturing process have a major advantage when it comes to identifying qualified leads. Automation allows sales teams to increase efficiency, preserve resources, and bring in more money. 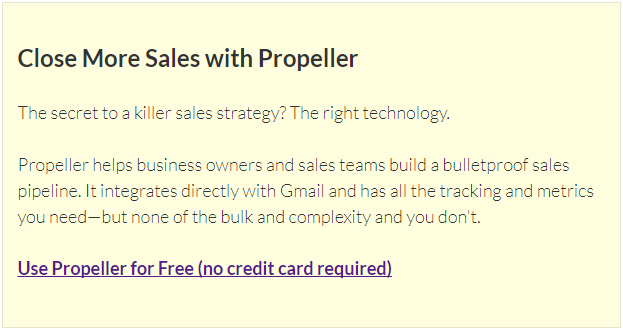 It makes sense – the more qualified leads you have, the more sales you’ll make. Annuitas also reported that combining marketing automation with documented sales processes increased revenue by 417%. 9. Nurtured leads make purchases that are 47% larger than non-nurtured leads. Not only does nurturing leads result in a greater number of sales, but it opens up more valuable opportunities, too. Research by Aberdeen found that nurtured leads resulted in 47% higher value per order compared with closed leads that were not nurtured. This is a helpful reminder that simply closing the deal is not always the best route to maximizing revenue. Taking the time to nurture leads makes it possible to build a better relationship with prospects, cater to their needs, and ultimately sign more valuable contracts. 10. 80% of sales require five follow-ups after the initial contact. 11. 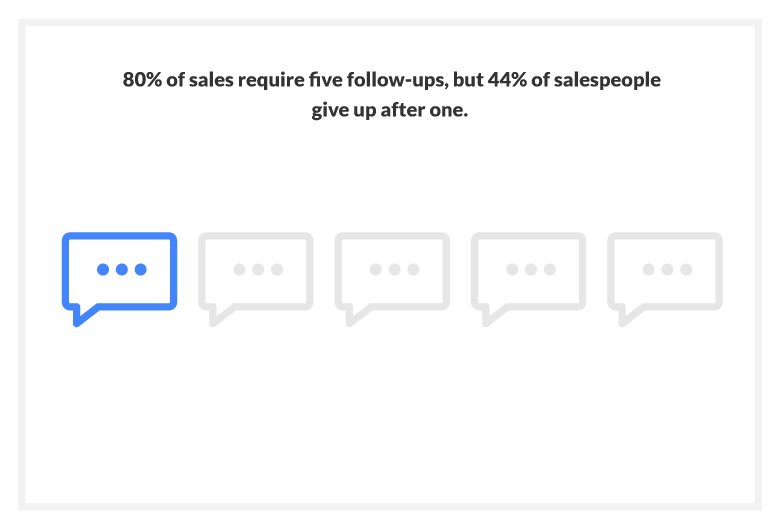 44% of salespeople give up after one follow-up. Take a moment to let those numbers sink in. The majority of sales require repeated follow-ups, but over half of all sales reps fail to reach out again after a single follow-up. The missed opportunities here are massive. This means that an overwhelming majority (92%) of sales reps give up before that crucial fifth follow-up. So those 8% of salespeople who do bother to follow-up five times are scoring more deals and making more bank than everyone else combined. In other words, 8% of reps are getting 80% of all sales. 12. 35-50% of all sales are won by the vendor that responds first. We’ve all heard that the early bird gets the worm, but did you know it was a statistically proven fact? The first salesperson to make contact has an inherent advantage over the competition. The psychology behind this statistic is linked to the value of self-selection. Customers want to make the right choice. They want to feel confident in their ability to self-select products and services. In many cases, this simply comes down to choosing the first brand or salesperson to create a positive experience or make a good impression. Self-selection also leads to a higher level of customer investment, which can mean an increased potential for repeat business and referrals. 13. Every year, you’ll lose around 14% of your customer base. Even if you’ve got a full deck of customers today, you’ll inevitably lose a chunk of them within the next year. The exact statistic varies between industries, but most companies lose between 10% and 30% of its customers every year (JoAnna Brandi). In some cases, there’s not much you can do to prevent customers leaving. For instance, some move away or no longer need your service. But a surprising 69% of customers leave because they don’t feel you care enough about them or their business. There are two important lessons here: never stop prospecting and never stop checking in with your existing customers. Your team should maintain healthy customer relationships, ensure your services are meeting client needs and providing value, and keep customer information and purchase preferences up-to-date. 14. Retaining current customers is 6 to 7 times less costly than acquiring new ones. Not only does losing customers hurt your team’s morale, it’s also a drain on resources. Yes, lead generation and customer acquisition are already part of your business, but they’re both resource-intensive processes with built-in costs. Even if you replace the 10-30% of customers you lose each year, you end up spending extra time and money on each new customer you sign. No matter how high the demand for your services, you can never afford to neglect current customers. Instead, look for ways to generate more revenue from your customer base, including upselling and cross-selling. 15. 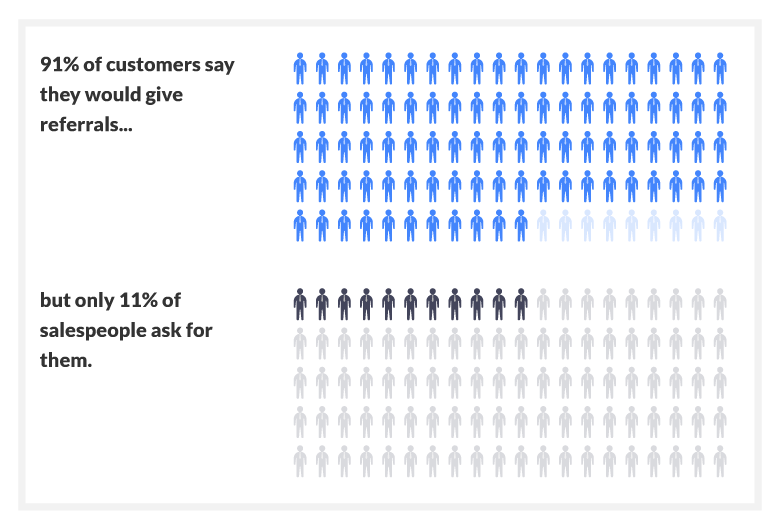 91% of customers say they’d give referrals, but only 11% of salespeople ask for referrals. An overwhelming majority of satisfied customers would refer your product or service – if you ask them to do so. The problem, however, is that only a fraction of salespeople bother to ask for referrals. Asking for referrals is such a simple solution that it’s hard to believe more sales reps don’t make the effort. If you’re not comfortable directly asking for referrals, it’s time to either get out of your comfort zone or develop a rewards program to incentivize customer referrals. Still not convinced? Research by Texas Tech found similar results: 83% of customers are willing to make referrals, but only 29% do. 16. Customers referred by a friend are 4 times more likely to make a purchase. Although today’s consumers are reluctant to trust traditional advertising, they’re very comfortable accepting recommendations from a friend or peer. According to Nielsen, 92% of people trust referrals from people they know. Additionally, BrightLocal found that 84% of consumers trust online reviews just as much as a personal recommendation. However, 27% of consumers are skeptical of reviews that seem planted or overly promotional – so it’s important to ask happy customers for referrals even if you’re collecting online reviews. 17. Salespeople who actively seek out referrals earn 4 to 5 times more than those who don’t. More referrals equal more sales as well as more profits. A good referral allows you to skip several steps of the sales funnel and brings qualified leads right to your door. Customer referrals are a powerful tool that not enough sales teams take advantage of. If you want to connect with more potential customers and land more lucrative sales, there’s no excuse for not requesting customer referrals, recommendations, and online reviews. 18. The average sales rep spends 25 hours per month leaving voicemail messages. 19. 80% of phone calls go straight to voicemail and 90% of first-time voicemails are ignored. Do you ever pause and wonder where the past month has gone? For the average sales rep, more than four workdays every month are spent talking to answering machines. That’s about 15% of your overall time on the job. RingLead calculated this based on stats that say sales reps leave an average of 70 voicemails per day. If each voicemail requires 30 seconds of listening to a greeting and 30 seconds to leave a message, that quickly adds up to 25 hours per month. The worst part is that 90% of those messages go unanswered. However, leaving shorter voicemails could solve two problems by allowing you to spend less time leaving messages and increasing your chances of getting a response. Sales Hunter says the most successful voicemails are less than 15 seconds long. 20. 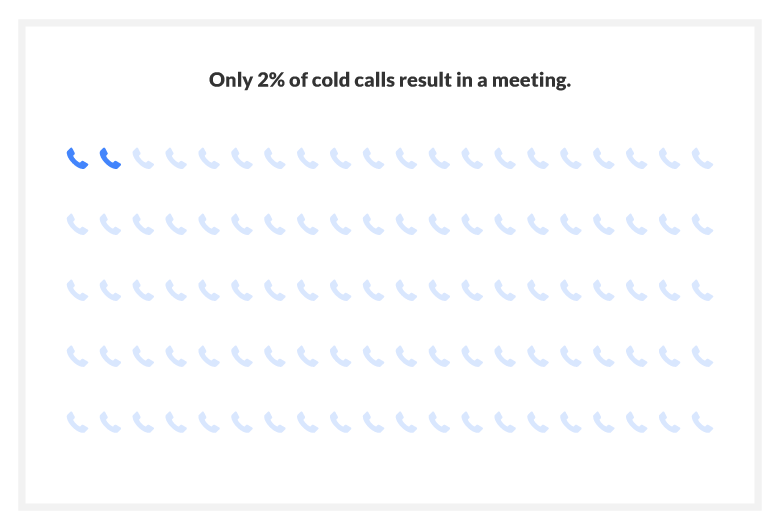 Only 2% of cold calls result in an appointment. As bleak as it sounds, this stat isn’t mean to discourage you. It’s meant to highlight the importance of warming up leads before reaching out. Send a quick email or comment on their blog before you pick up the phone to call. Prospects always will be more receptive if you’re already on their radar. As for those 2% who are comfortable making a purchase right away? They’ve already done their homework and know exactly what they’re looking for. You might experience this if you’re in the right place at the right time, but it’s safe to assume most of your prospects will take some work to warm up. Let us know which statistic you found most surprising, motivating, or hard to wrap your head around. 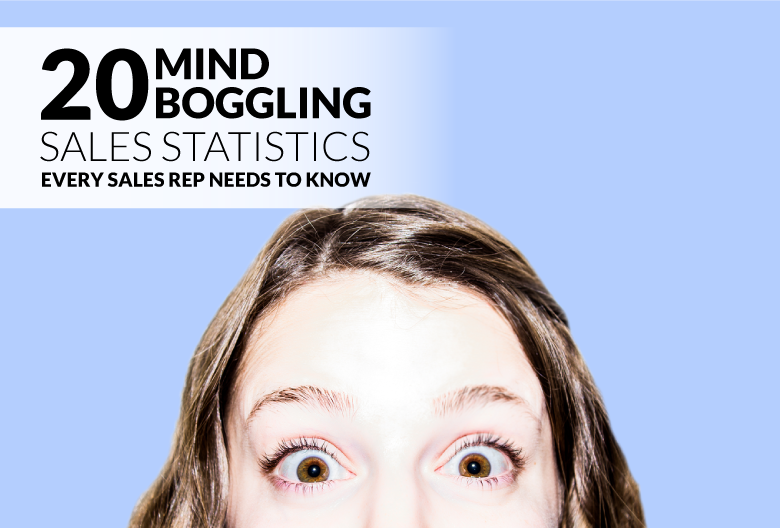 What’s the most mind-boggling sales statistic you’ve come across recently?